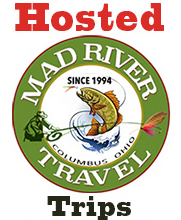 Mad River Outfitters is proud to offer a wide selection of fly fishing excursions. All of our trips are tried and tested before we offer them to the public and are done in conjunction with some of the finest outfitters and guides in the business. With all of our trips, you simply get to the destination from your home town and we take over from there. Click a link below to view details and pricing on the trips that we offer. Please give us a call at 1.888.451.0363 or drop us an e-mail. Read over our Travel Payment/Cancellation Policies page. Be sure to check out our Guide Services as well - for Ohio, the Great Lakes Region, and Beyond! You get to the destination and we take over from there.